Well I wanna put this before & after pic at the front of my post cos I was super awed by how fast and effective it is. Even the pores around the acnes seem to be smaller! 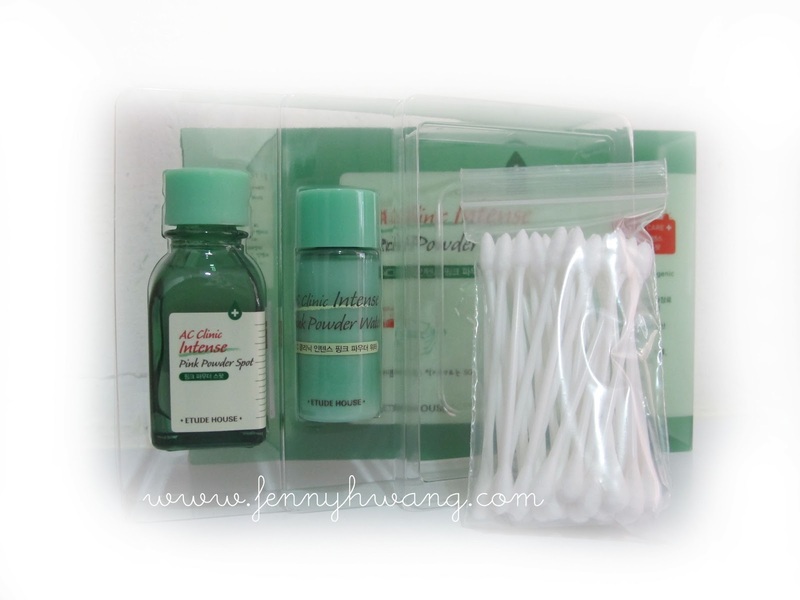 The AC Clinic Intense Pink Spot Powder set comes with a small Pink Spot Powder water and a packet of cotton buds which has a sharp tip to precisely apply the Pink Spot Powder. Do not shake the Pink Spot Powder when using! 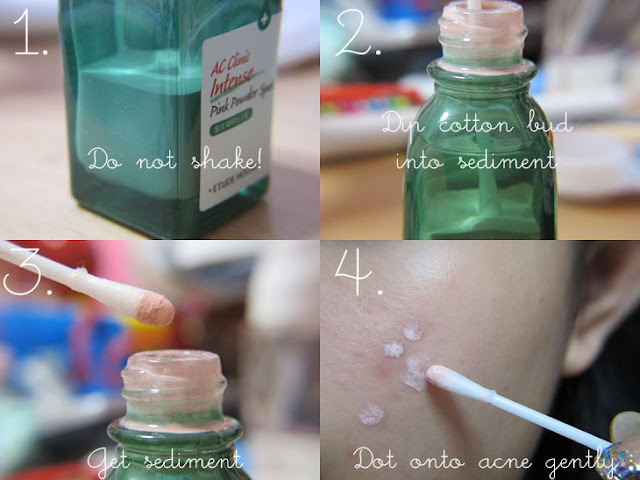 All you need to do is to dip a cotton bud into the sediment (pink powder that settled in the water) and apply only to acne spots. It dries out the acne with its oil-absorbing qualities. Also, it contains natural salicylic acid (which kills acne bacteria) and also Hinoki Cypress, Chaga Mushroom and Saururus Chinensis extract which are the best natural ingredients to heal acne. The smaller bottle, which is the Pink Spot Powder Water, is more for use in the day (is white in colour) and can be worn over make-up. 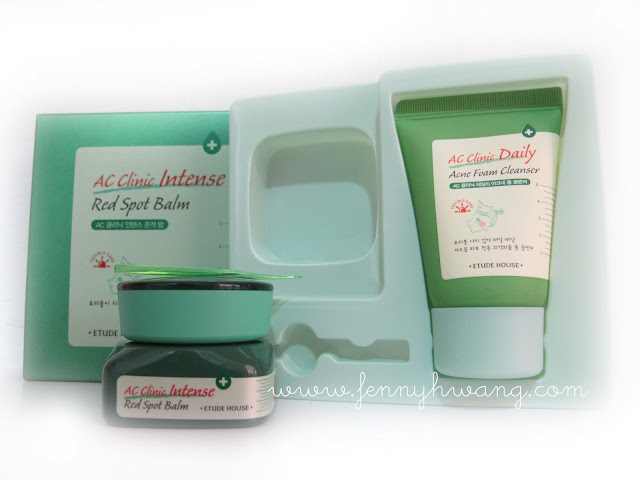 In fact, do you know that all products in Etude House AC Clinic line are non-comedogenic (doesn't clog pores)? AWESOME!! P/s. the product is really effective on acnes so it stings when you apply it. It is completely normal. The Red Spot Balm is something really cool - it is made specially to whiten and fade acne scars! I know right, live saver this product is! Because everyone has their youth a.k.a. puberty, we are all prone to have breakouts and acne as we are growing up. Some of us may no longer have acne, but scars remain. This is the best invention ever, to lighten scars and reveal new and bright skin again~ Generally, I apply this on my acne area and massage till it absorbs. Its very hygienic cos it comes with a spatula to scoop out the cream instead of having dig your nasty fingernails into it. It feels really moisturizing too, so no worries that this product will dry out your skin. Its soft and silky and gets absorbed quickly. It comes with a mini AC Clinic Daily Acne Foam Cleanser which I loveee and will purchase the bigger one. It has a herbal smell and my skin feels squeaky clean after, and gets your skin ready for more acne clearing action. MAHNI MAHNI SARANGHAE AC CLINIC LINE! 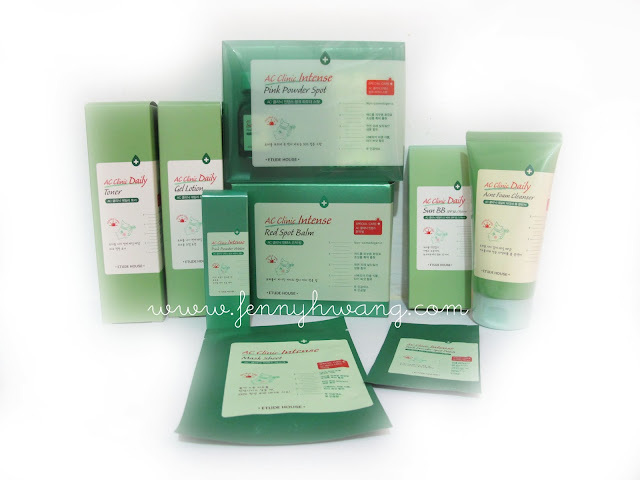 *Only AC Clinic Intense Pink Spot Powder & AC Clinic Red Spot Balm were provided by Etude House Global for this review. Views and opinions are my own. Okay, sorry again about the quality cos I ripped it from my IG too hehehehe. is it the product be giving free for all blogger?? Could you do a review on the CC Cream and Cotton Fit BB Cream? :) I would love to read about it! I don't think so as this series is very strong and contains alcohol. is the toner,lotion,red spot balm, pink powder spot, pink powder water just use around acne / all face? thank for posting ! i love this blog so much.